In 1887, Robert Stephenson took over a disused shipbuilding yard on the elbow of the River Tyne at Hebburn. The yard was formerly occupied by McIntyre & Co Ltd and had been empty since 1884. It had a river frontage of 800 feet and five building berths within a total area of 17 acres. In 1888 a boiler shop was erected on the site and a shear-legs capable of lifting 100 tons set up. Their shipbuilding numbering system continued the sequence started by McIntyre in 1884 and therefore starting with number 5. A large graving dock, 700 feet long, 90 feet wide and 29 feet deep at the entrance was added in the early 1900s. The Hebburn Yard did not prove successful, and the last ship was completed in 1909. The yard became part of Palmers Hebburn Co Ltd in 1912. 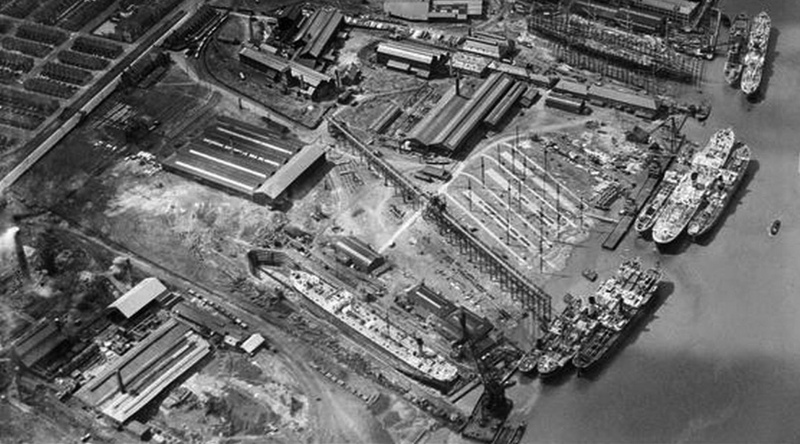 With Palmer's collapse in 1932, the yard was again closed, but re-opened in 1934 as part of Vickers Armstrong, as a ship repairing yard. During the Second World War, the yard was heavily involved in the repair of warships. Following closure in 1970 the yard was merged with Swan Hunter in 1972. The above photo shows the site of the Stephenson yard at Hebburn. Even though the photo dates from 1936 the key features of the Stephenson yard are still visible. Note the dry dock at bottom centre and to the right of that the long diagonal crane gantry, then the building berths and finally at the top right of the photo the Hawthorn-Leslie yard is just visible with a ship on the berth.